Ah, SPAM! The breakfast meat of my youth. It's funny how certain things trigger memories. 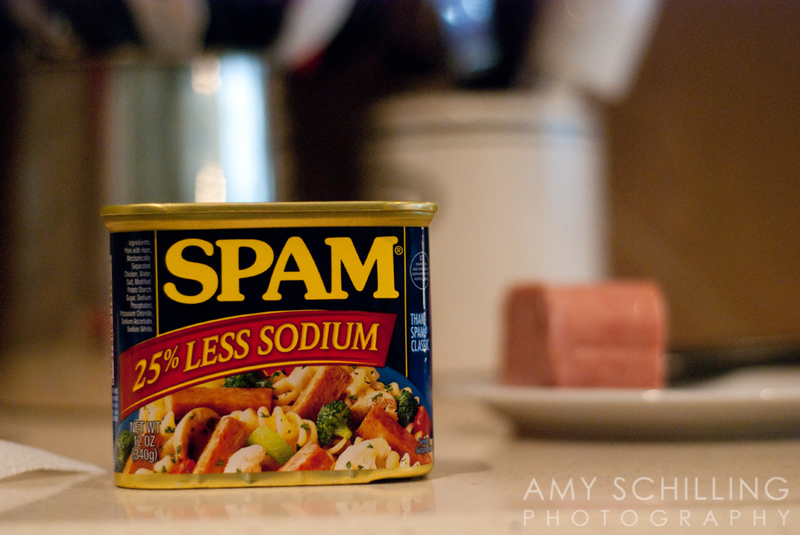 Every time I see a can of SPAM I think of my grandparents. How many mornings did I wake up on a couch full of cousins to the smell of coffee, hearing the never-ending chatter of my Poppaw telling my dad how the world should be, seeing my Granny standing over the stove, frying SPAM, beginning to prepare breakfast for the masses. Mornings spent scrambling to get to a bar seat first, watching the ducks swim by through the blinds, enjoying my oatmeal and eggs and toast...and SPAM. Leading into afternoons spent working up the courage to join almost everyone else on the paddle boat, only to end up staying on the bank. Afternoons standing side by side amongst half a dozen cousins fishing with our cane poles, actually touching worms. Then everyone arguing over who got to ride which bike but not really caring because we got to ride! By ourselves! Around the lake! And evenings spent playing bingo at the clubhouse, or watching Golden Girls as we took turns earning change for combing Poppaw's hair as he sprawled out on the living room floor telling tales, interrupting the TV. Always ending the night with ice cream. Gosh, how many summer trips to the pool at Lake Livingston or day trips to Brenham or the park or museums or weekends at the lake started with a can of SPAM?! So many. I'm glad I remember the good times, the great memories, the trips, the treats - all of it. Because I know I took so much of it for granted back then and I can appreciate it all so much more now. I miss all of my grandparents, I really do, but sometimes I miss that ornery Poppaw so much my heart hurts for all the things he's missing now. The year he had open heart surgery I must have been 11 or 12, not yet old enough to technically get into the ICU. My aunt put a little makeup on me to make me look that extra year or two older (seems so silly now :) ) and when I went in to see him for the first time in recovery through all the tubes and wires, he started to sing "The Bear Went Over the Mountain." Goodness did he ever drive us crazy with that endless song growing up, but the words were so sweet to me that day. It's the day I started eating mustard on toasted bagels and the day I realized Houston might have a homeless problem, driving home on the interstate that night and looking over to see scores of people sleeping in the parking lot of an overflowing shelter, and it's the day I started loving my Poppaw even more. Right...so SPAM! I bought a can some time ago for old times' sake and recently cooked it up for brunch one day for Avery and me. And it was really good! Just like I remembered.